On the morning of Thursday, August 17, 2017 the LIGO-Virgo Collaboration (LVC) gravitational wave detectors picked up a signal indicating a binary neutron star (BNS) collision. For the astronomers privy to the news of this detection, it was just the beginning of a momentous day. Why was this day special? While LVC had detected four gravitational wave events already, they were all binary black hole (BBH) coalescence events. The discovery of gravitational waves was undoubtedly one of the biggest finds in the history of physics, but if there was any downside to those events, it was that BBH mergers were not expected to give off any electromagnetic radiation from radio, to visible light, to high energy gamma rays. Many astronomers pointed their telescopes towards these events just in case, including those of the Dark Energy Survey, but no light was seen. While this matched predictions, astronomers and physicists were left waiting for an even more exciting event, a gravitational wave detection from an event that could also be seen in the electromagnetic spectrum. The most likely candidate for such an event was a binary neutron star (BNS) collision. Evidence that the August 17 event was special came almost immediately. The Fermi Gamma-ray Space Telescope saw a signal on its “Gamma-ray Burst Monitor” two seconds after the gravitational wave detection by LVC, which perfectly matched model predictions for a BNS collision. As this information was emailed to astronomy groups partnered with LVC, it was clear that this event had to be searched for in optical light as soon as possible. And so it was that many major optical telescopes on the Earth eagerly anticipated nightfall that Thursday night, to aim into the ‘localization region’ that LVC and Fermi had narrowed down in the sky, in the constellation Hydra (the sea monster). Our friends at the gravitational wave and gamma-ray detectors had pinned down the area we needed to search to just several handspans worth of angular area in the sky this time (compared to an order of magnitude larger localization area for the earlier BBH events). 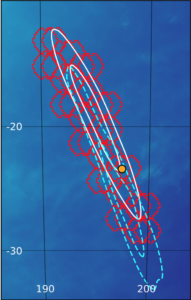 Red hexagonal type shapes indicate each ‘pointing’ of DECam, trying to cover the LVC-predicted localization ellipse region, from Soares-Santos et al. On the morning of August 17, with the BNS announcement from LVC, it was now ‘all systems go.’ Dozens of emails rolled through the DES-gravitational wave list, people communicating all over the US along with observers down in the control room at CTIO high in the Andes. They discussed where the telescope needed to be pointed, what filters to use, time settings, software scripts and so on — there was an intense sense of anticipation in the air. They knew a region as large as the outside white ellipse in the figure on the left would need to be covered fully to find where the new ‘transient object’ was. Attached is tonight’s image + ps1-3pi. Galaxy is at 40 Mpc. The one to the right here is a previous image of galaxy ‘NGC 4993’ (about 130 million light-years away), taken by the Pan-STARRS telescope on Haleakala (Hawaii). 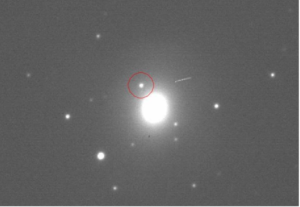 And the one below was taken by DECam on the night of Aug 17 — note the bright point Chornock circled, next to the galaxy. Though just a tiny little blip in this image: that’s it — that was new, and had never been seen before in images of this area of the sky. There it was, the long awaited ‘smoking gun’. For those of us who first saw this image within minutes of it being taken and Ryan sending it out on the DES-GW email list, the whole thing took on an air of surreality. This was something we had long, long waited for: an event seen by its emission of gravitational waves, gamma rays, and optical light. Detecting the same event in such different ways was a confirmation of our understanding of physics in a manner never seen before. This long hunt of the last two years (and in some sense, the fifty before that, going back to the early searches for gravitational waves, and then the founding of LIGO itself in 1990), had reached a very major milestone. We little humans on an insignificant little planet in some obscure corner of the Universe had done it again, dared greatness, banded together into collaborations with an ability to go above and beyond our individual selves and discovered another long-held secret about our vast Universe. For even just those of us not so currently active in the search, but just watching the live emails come in, in those heady hours, there was a sense of shock, elation, flabbergasted amazement, and pure joyousness that it had really happened. These kinds of periods are rather few and far between in the lives of scientists. But this was one that will not be forgotten for those who shared in seeing it happen in real-time. In fact, within about 2 hours, some 6 major observatories saw it — booming out, bright as day, that dazzling point of light right next to that otherwise ordinary elliptical galaxy. Details of this discovery can be seen in papers here and here. Another image of it shows the DECam picture from that night on the left, and on the right the observation 2 weeks after, when the object had totally faded away. Because galaxies generally have dim extensions with stars still bound to them far beyond their bright edge, astronomers associate things that close to the edge with the galaxy. They look to use spectroscopy when possible to determine that the star is moving at the same rate as the galaxy, indicating the star really is a part of the galaxy and not much closer or further away. So how does all this change astronomy? We are now able to connect gravitational waves with objects we can see with electromagnetic waves (light), which astronomers have used to stare into space (with the help of telescopes) for centuries. Gravitational waves are another step closer to being on par with EM waves as a way of ‘seeing’ the universe. Every time humans have opened a new way to see the Universe, we have discovered amazing new things. This is fully described in one the papers published today, available here. More specifically, these particular events can answer key questions about the structure of matter in extreme states, and even some of the fundamental laws of physics. A few examples of this are the potential to study the neutron star ‘equation of state’ which is connected to the study of the strong nuclear force, which is what binds protons and neutrons together inside of atomic nuclei, and also powers the Sun to shine. Another is using this event as a ‘standard siren’ to extract the expansion rate of our Universe from a totally different method than has ever been used before, which DES is also releasing a paper about today, led by Daniel Holz, here. And perhaps most exotically, even to probe our best current theory of gravity, Einstein’s general relativity (GR) in ways it has never been tested before. Today is an exciting day in astronomy and physics. 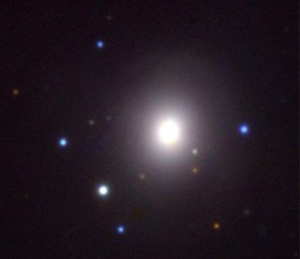 It is likely just the beginning of combining gravitational wave astronomy with visible light astronomy. Who knows what future discoveries using both of these ‘eyepieces’ into the Universe will find? Mandeep is a staff researcher at Stanford University. He has worked on the master lens database for the Strong Lensing group, did initial work on a pipeline option for the Weak Lensing group, and more recently worked with the gravitational wave event optical follow-up group, as well as was an internal paper reviewer for several now-published Strong Lensing papers. 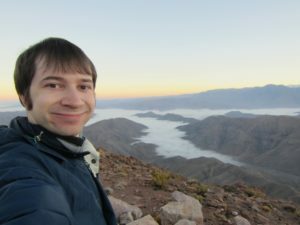 Further, he has taken a 10 day shift at Cerro Tololo Inter-American Observatory (CTIO), and is active in several Education and Public Outreach projects. Ross is an astrophysics PhD candidate at the University of Chicago. He works on various projects studying the large scale structure of the Universe using the millions of galaxies DES observes. These projects include galaxy clustering, correlations of structure with the cosmic microwave background, and using the structure of the Universe to infer redshifts of galaxies. Ross is also an active science communicator, volunteering at Chicago’s Adler Planetarium as well as writing and editing for The Darchives. 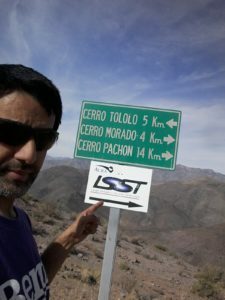 He also loves observing for DES in Chile, where he has observed more than 30 nights.